Red currants are usually a Christmas time treat with their most appropriate Santa Claus colour but they will be all over by Christmas this year. I love to pick one or two as I pass to get their pop of tart sweetness. Unfortunately so do the local birds! You need to net the bushes because one day you look at them and say harvest day tomorrow, but when tomorrow comes there is not a currant left. I accidentally discovered in my previous garden a way to trick the birds. I planted them rather too close to an area where I had planted native shrubs. I thought I would have to move them because they would not ripen out of full sun, but I discovered hidden behind a Corokia hedge ladden boughs of untouched red currants ready to eat. I decided my first harvest of 2017 would be used for a special pancake breakfast that included red currants and my total harvest of gooseberries! 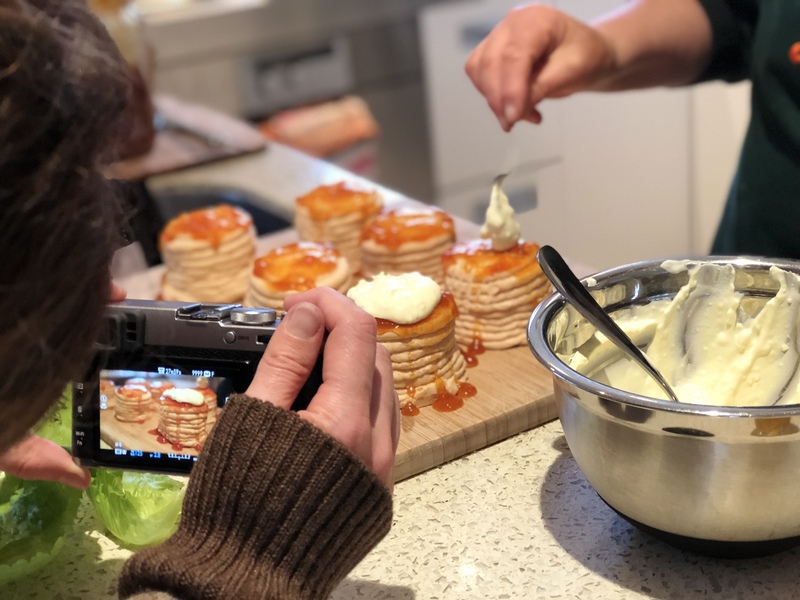 I have posted about pancakes before but I wanted to try a Stephanie Alexander’s recipe to see if I could perfect my pancakes..and the result – incredibly light pancakes. The addition of red currants made them even better. ( I have made as per usual some changes but you have the option below of following Stephanie’s recipe without my suggested changes). Have your oven on at 100ºC with your oven proof serving dish warming ready for the pancakes. Put separated egg yolks into a large mixing bowl. Add buttermilk/kefir and whisk well. Add the soaked oats (optional). Sift flour, salt and baking soda over the egg yolk mixture and fold in with a large metal spoon. The batter should be of a thick, dropping consistency. (I did have to add a little more flour in mine because the soaked oats made the mix thinner.) I always add the butter or oil last before folding in the egg whites because pancakes can become tough if the butter is overworked. When ready to start cooking fold in the egg whites. I start this process with a little of the whisked egg whites folded in first – to pave the way and lighten the batter mix before adding the rest of the egg whites that have been whisked to form soft peaks. Stephanie adds the fruit she used (400g hulled and sliced strawberries and 300g of blueberries) and she mixed them in at the batter stage. I wanted to make sure my ripe red currants were kept as whole as possible so added them by folding into the aerated mix after the whites have been added. The best way to cook pancakes is in a cast iron pan because the heat is not patchy. This traditional skillet with no edges usually used for making piklets is ideal. If you are lucky enough to own one of these or a cast iron crepe pan then that is ideal, just because it makes it easier to flip the pancakes. But any cast iron pan is great. The trickiest part of the pancake operation is getting the pan to just the right temperature. It’s especially tricky on a gas hob. Test with a baby pancake. Smear butter or oil on the surface and once to the right heat pour spoonfuls of batter onto your pan to make the size of pancake you like. Once bubbles start bursting on top, it’s time to flip them over. Once cooked stack onto the plate in the oven. The sauce I made came from my rather small gooseberry harvest. Into a pot I melted about 1 tbsp of butter, added the gooseberries and sugar to taste (about ¼ cup from memory). To make the gooseberries really hum I added about a tbsp of my last year’s Elderflower cordial because gooseberries and elderflowers are a perfect match. You really fry the fruit until it becomes juicy as it cooks with the sugar. I used the potato masher to crush the cooked berries to create a thick sauce. Stephanie made a sauce the same way using 1 cup of mixed berries, 20g butter and 1 tbsp of maple syrup. We shared our pancake breakfast with our friends Jan and Wal from Christchurch. Jan did the busy job of cooking the pancakes and Wal sliced a chilled mango to enjoy with our breakfast. The mangos come in every year before Christmas from Queensland and are the best we are likely to find in the shops all year, so I am passing on this information and thanks to Wal will be hunting out the Queensland mangos for Christmas. Red currant summer jewels are here for such a short time but they do freeze well and I have saved some to share with the family over the holidays with a pancake breakfast.